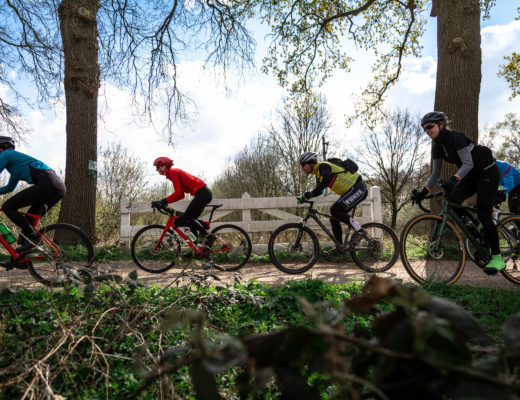 If you haven’t got your winter cycle wear sorted yet, this is the post for you. 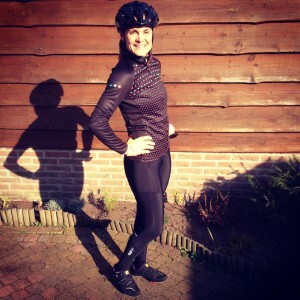 I have tested 4 winter bib tights (with pads!) priced 110 euro or less. I tried to keep it under a 100, but I had to add the 110 euro bib by Gore. It features waist zips for discreet toilet breaks, one of the few in this category. All 4 are of these cycle tights are good value, and I would recommend them depending on your specific needs and body type. So read on and find out where to get your best budget winter bib! 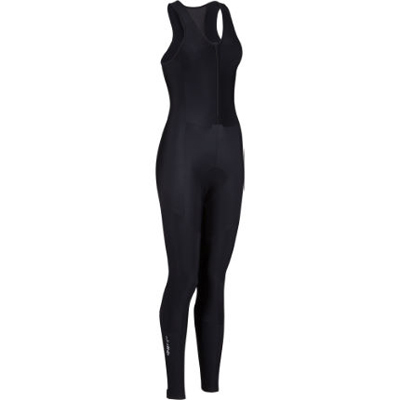 B’TWIN, a brand sold exclusively at Decathlon, offers 2 different pairs of bib tights for the female cyclist this season. I decided to test the B’TWIN 700 women’s warm cycling bib tights, because of the seamless white suspenders and the pretty pink and blue detailing at the ankles. An extra small would normally be my best fit, but in this case I would go for a small. The tights are very snug. 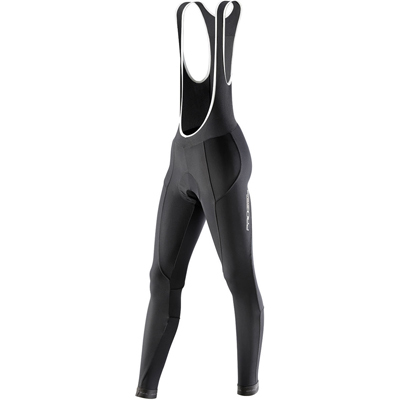 Although I like feeling strapped in when it comes to bib tights, these where retraining my movement a bit. They felt especially tense at the back of my knees, and where my leg is attached to my torso. That said, the design of the tights is very smooth, no complaints there. Then there are the suspenders to consider. The fabric is great, it feels similar to my light and breathable undershirt, and it doesn’t irritate your shoulders because of the stretchiness and the seamless finish. The straps come together in a mesh racer back with a simple pocket for cards and keys (see top picture!). So far, so good. I am not impressed, however, with to the attachment of the suspenders to the bib tights themselves. They come together just above the belly button which is also where my middle folds when I’m on my bike. I’m pretty sure this applies to most people. I wish B’TWIN had lengthened the tights just a little, placing the rim just under the midriff. On my test ride of 1,2 hours I could feel a slight but constant pressure from the rim. I didn’t leave and marks, so call me fussy, but you have been warned. The B’TWIN 700 bib is designed for long rides of three hours or more in winter weather with temperatures down to minus 5 degrees Celsius. I think a -5 claim might be pushing it, but they are certainly warm enough for single digit temperatures. A big thumbs up for B’TWIN’s self designed chamois. It is the most complex looking of the four tested and I rank it as the best. It should keep you comfortable for long distance rides, with nice thick foam right where you need it. The pad design also allows for a bit of airflow due to the ‘comfort channels’. Less stickiness = less friction = less saddle pain. Smart stuff. Elastic Interface long distance pad, the Giro Air. The dhb Classic Roubaix is an improved version of last seasons Vaeon Roubaix Bib tight. Comparing the features of the two I can only spot one difference: the chamois. The Classic Roubaix has a Giro Air fitted and the Vaeon is fitted with the Speed, both by Elastic Interface. My test ride was over 2 hours long and I was especially pleased with the well designed fit. No chafing, rubbing or itching anywhere. The front zips up to above chest height, offering more warmth than suspender bibs and a nice snugness around your upper body. The bibs are made of Lombardia 235g Roubaix Lycra fabric. 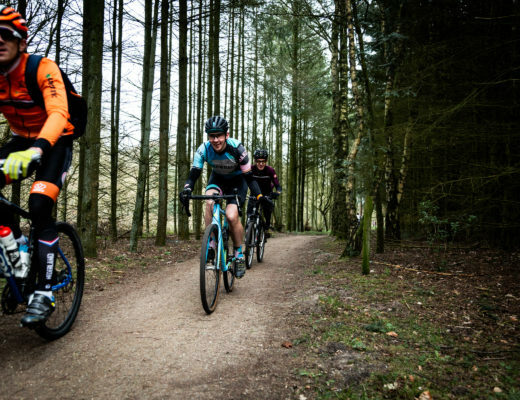 Roubaix Lycra is a technically advanced fabric that keeps you warm but allows for some ventilation too. It keeps your skin from getting too clammy, so you are spared the cold shivers on a downhill segment. Always avoid the shivers. The seams are slightly raised, and after my ride I can see how the seams have dug into my skin. I didn’t notice this while riding, but perhaps on very long rides you’ll experience a little chafing from the seams. 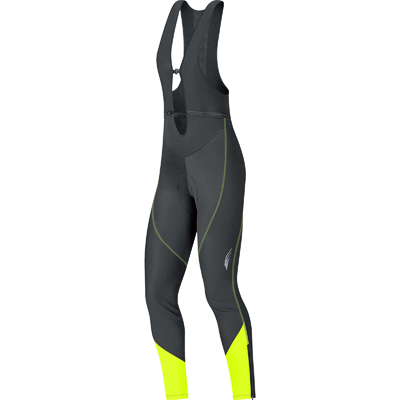 The 235g variety of this Lycra is best suited for temperatures between 8 and 15 degrees according to the manufacturer. It was 12OC when I went out, and the bib was pretty warm. So don’t go out in these tights when it’s freezing (not for hours at a time anyway), but down to 5 degrees be fine. The Roubaix bib sports elasticated silicone grippers to keep the tights from sneaking up. The reflective dhb logo and details on the rear of the calf haven’t changed position since last season’s model. They are visible, but not sufficient to get you noticed when out riding in the dark. If super reflective bib tights are what you’re after check out dhb’s Flashlight bibs or Altura’s Night Vision line. I’m pleased with dhb for telling us exactly which chamois you’ll find in this bib. It’s the Giro Air made by Elastic Interface. Their recently updated site www.elasticinterface.com doesn’t feature the pad, but Wiggle assured me the Giro Air is as good as it’s ever been. The Giro is designed for 3-5hrs of riding and has ‘an indisputable reputation for durability’. So far my experience with this pas had been very good, and I have been on a 2,5 hour ride wearing it. The top layer is a very soft and moisture absorbing fabric covering a generous layer of padding designer to fit the slightly wider female bottom. The design doesn’t allow for any airflow making it a bit muggier that the B’TWIN pad. 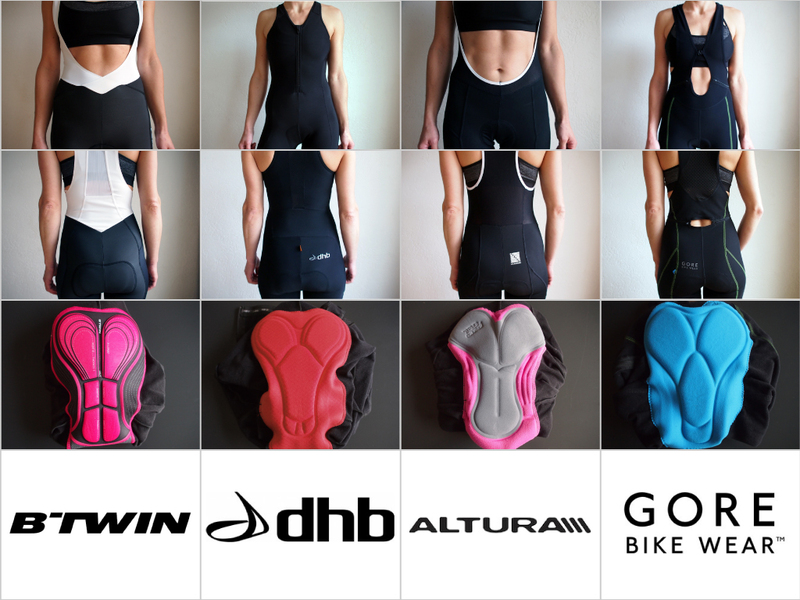 The UK brand Altura proudly claims a strong commitment to women’s specific cycle wear. Their women’s collection is designed by women for women, because women understand the specific needs of the female cyclist. I think men are perfectly capable of designing fantastic women’s clothing too, but I like their dedication. With this statement in mind I changed into the Altura Womens Synchro progel Bibtights. The attention to details is notable. There’s a mesh strip curving around the bellybutton, pre-curved legs, silicone leg grippers and an 8-panel women specific design. The bib straps have pronounced rims and are placed wider on the shoulders than the other bibs with suspenders. Which doesn’t seem very women specific to me. 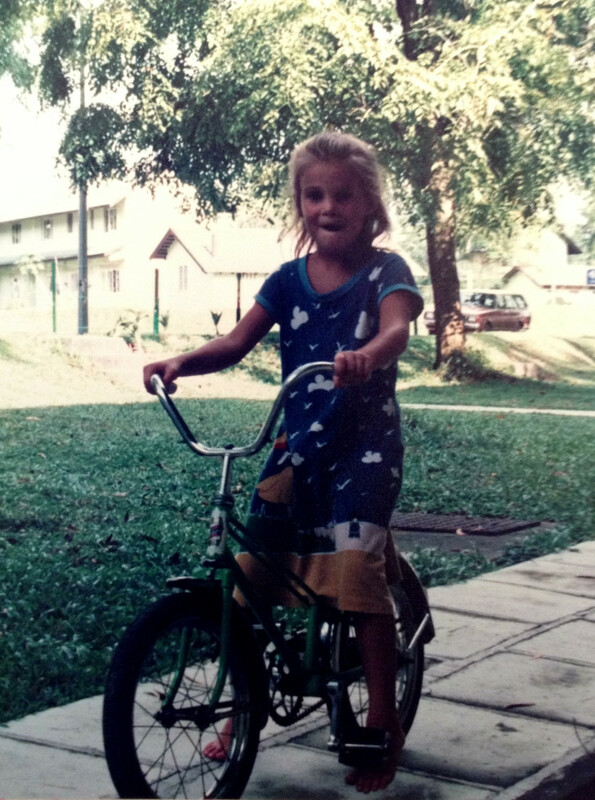 There wasn’t much difference in comfort while riding, although I prefer the seamless white B’TWIN straps. The soft stretchy fabric incorporates Altura Thermo™ technology, which should offer body warming insulation and warmth, whilst maintaining thermoregulation. In short, it should keep you warm without making if feel like a sauna in there. And it delivers perfectly. It’s a tight fit, the UK 8, but I don’t feel restricted in my movements. Roubaix is a soft brushed, wicking, stretch Lycra that is mildly fleecy to the touch. Roubaix cool-weather cycling garments are warmly welcome on cooler days. The Multi Density ProGel™ pad has a 3-layer design: bottom layer, pro-gel insert and a firm saddle shaped top layer. This should bring the female cyclist added comfort and support in high pressure area’s and improve shock absorption. Surprisingly, a rather large logo has been pressed into the pad right where your bottom rests on the pad. This feels rather uncomfortable, which is a shame, considering the great deal of effort put into the ProGel™ feature. Features an Elastic Interface cycling pad, the pad type is not mentioned, just that is comprises of two foam densities and is recommended for 2 hour rides max. The Gore Element Bib tight is aimed at the recreational female cyclist who wants to stay warm on winter rides. The first thing you notice when you stick your leg down these tights is the lovely softness of the fabric. I love the feel of fresh-brushed fleece! The bib’s design makes for a smooth and comfortable fit, with flat locked seams and pre-shaped knees. The material is super stretchy and will keep you nice and warm, but it doesn’t breath as well as the others. I don’t see any sign of the ‘additional layer of thermo-stretch-functional fabric in knee-area’ that is mentioned on the site. So if you are like me and you get sweaty around your knees while cycling, this fabric won’t help you out. The ELEMENT tights do feature a mesh racer back, which looks good and feels comfortable. The Gore bib has a very relaxed fit for an extra small, I would recommend ordering a smaller size than you would normally choose. It hasn’t got any (hidden) pockets or ankle zips. There are very subtle reflective markings; I don’t recommend these tights for a ride in the dark, even with the neon inserts. On my test ride the pad’s shock absorption performed fine, but the fabric is not of the breathable kind. The reason I’m adding this Gore bib to the test, even though it cost over 100 euro’s, is because it has smartly placed zips so you can go for a pee (Gore calls it a bio break) without stripping down to your sports bra. I don’t like stripping in public, so I was quite enthusiastic about this feature. To test the feel of the bib properly I wore it without an under layer. Unfortunately this meant I could feel both zippers itching my lower back constantly. It’s a shame Gore decided not to cover them up with a small anti-chafing fold. Adding an under layer reduces the itching considerably, and those of you looking for a way to pee more discretely should certainly consider these tights. It might pay to have a look at the more expensive bib tights Gore offers, which have the same feature. On at least one pair (ELEMENTS Windstopper Softshell) I have found the zips are designed differently, with just one zipper (instead of two) running al the way around and closing at the front. This reduces the chance of chafing or itching a great deal. I choose for the dhb and have been pleased with it performance on my 3 rides so far. I fell for the snug upper body design, keeping my stomach and chest warm. The pad is simple but does the trick, and the fit is perfect. Improvements would be a little colour in the design and maybe a more sophisticated pad for more airflow and shock absorption. But for just under 60 euro’s this is a great deal.